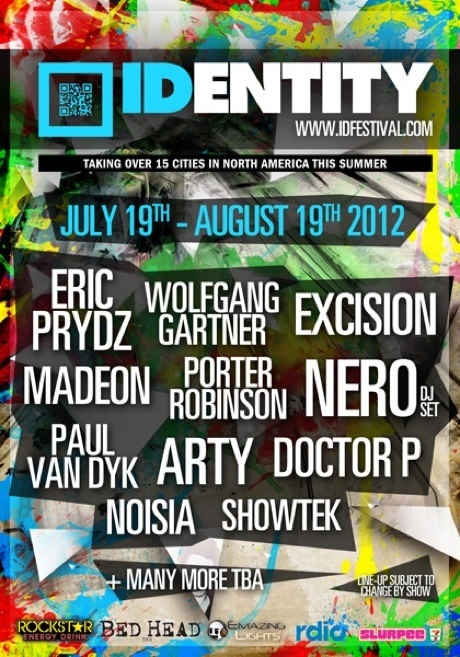 Kicking off this week is ID Fest, or “The Warped Tour of Bass Music”. The month long tour stops in 15 cities and features nearly 30 performers. The line-up reads like a who’s who of EDM masters and the selection of venues ensures the production with be top notch. Artists performing at ID Fest include (alphabetically) Adrian Lux, Arty, Audrey Napoleon, Bingo Players, Cole Plante, Datsik, Doctor P, DVBBS, Eric Prydz, Eva Simons, Excision, Hardwell, JDevil, Kerli, Le Castle Vania, Madeon, Mightyfools, Nero, Noisia, Paul Van Dyk, Porter Robinson, Rye Rye, Showtek, Static Revenger, Stephan Jacobs, The Eye, The Gaslamp Killer, Wolfgang Gartner. Set times will be made available as the start of the festival gets closer.